Welcome to the canning blitz week! 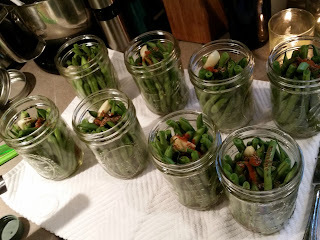 This week I'll be sharing all the recipes that I've canned recently. Today it's dilly beans. Then there a few apple recipes and something with green tomatoes - check back to see what it is! Do you know what a dilly bean is? It's quite simply a pickled green bean. If I'm being honest I'll have to admit that I wanted to make pickled green beans solely because "dilly bean" is incredibly fun to say. "Hey, what did you do today?" "I made dilly beans!" See... so fun! (And Patrick thought I was crazy when he heard that.) 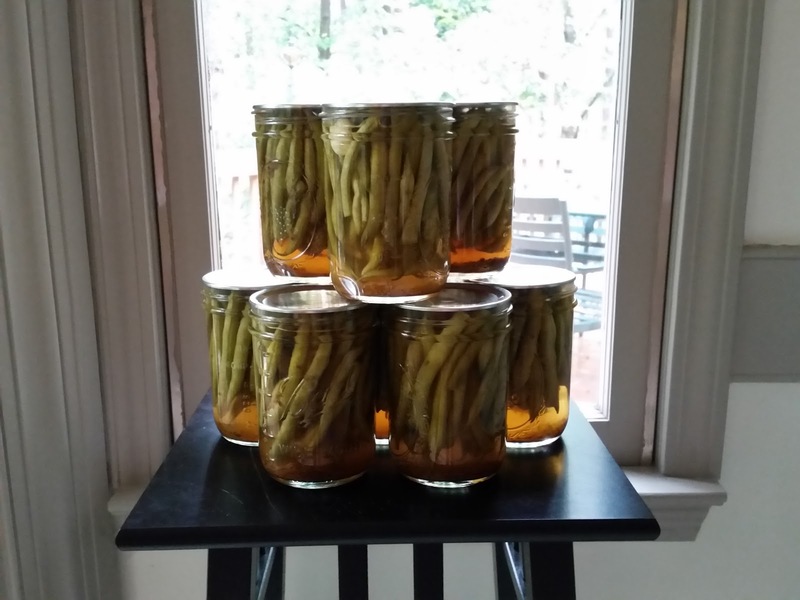 Fun name aside, imagine our surprise when these dilly beans turned out to be awesome. I'm not a huge dill fan so I wasn't 100% sure how much we'd like them as I'd never actually had dilly beans before. Now you're probably thinking I went and spent money on produce to make something I wasn't even sure I'd like. But I wouldn't do that! My dad called to say he had some green beans fresh from the garden for me. Little did I know that it was four pounds of green beans! 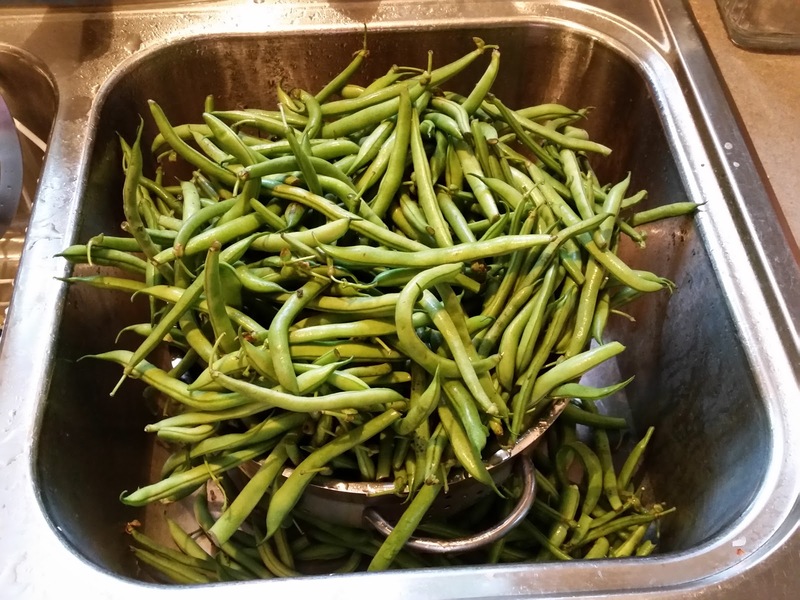 And four pounds of green beans is, ironically enough, perfect for a double batch of dilly beans. So off I set to can eight pints of dilly beans. Trim ends off green beans. Combine salt, vinegar and water in a large saucepot. Bring to a boil. 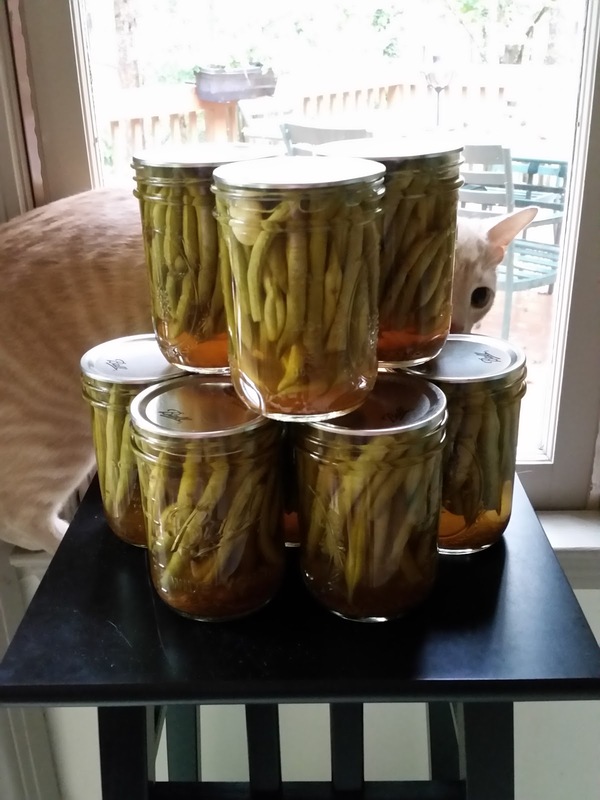 Pack beans lengthwise into hot jars, leaving 1/2-inch headspace. For pints: add 1/4 teaspoon cayenne pepper, 1 clove garlic, and 1 head dill (or 1 teaspoon dill seed). For quarts: add 1/2 teaspoon cayenne pepper, 2 cloves garlic, and 2 heads dill (or 2 teaspoons dill seed). Add Pickle Crisp to each jar, if desired. Ladle hot liquid over beans, leaving 1/2-inch headspace. Remove air bubbles. Adjust two-piece caps. Process pints and quarts 10 minutes in a boiling water canner. Let beans stand for at least 2 weeks before tasting to allow the flavor to develop. A few notes: The cayenne imparts just a bit of spice; it does not provide an overwhelming kick of heat. 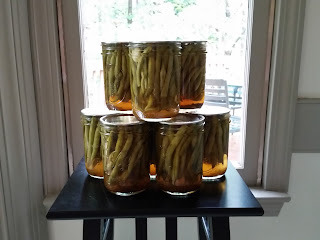 I used wide mouth canning jars since the green beans were placed into the jars by hand. The wide mouth jar allowed for maximum green bean placement. I did not use pickle crisp. I'm not 100% sure what it is. This is a downfall of not growing up and watching someone can. Sure, I can google around and figure out what it is but for something like I prefer a seasoned canner's opinion. I've done a few recipes without the pickle crisp and haven't seemed to need it. Maybe opening the jars after more than a few months might make a difference? And finally I used the dill seed instead of a sprig of dill. I desperately wanted fresh dill but only for aesthetics. Dill must be a fragile herb; it was too hot for dill said all the farmers market vendors and there was no fresh dill to be found. Outtake 1: Dupree helping with the photoshoot. Good but a little spicy for my taste. Good to eat along with something else like cheese and crackers.